Alone on the road trying to hitch a ride to California to start a new life away from the unwelcome attention of her sleazy stepfather, Nancy hooks up with a pair of good natured petty crooks on a road trip to nowhere special. Things take a dark turn when they decide to camp out in the woods and her new friends meet an untimely end at the hands of a pair of backwoods cops. Now, Nancy is in danger of being sacrificed to Satan himself by the wayward lawmen and their twisted siblings in an insane attempt to resurrect their mother's mummified corpse. 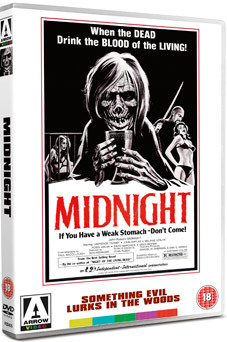 Adapted by John A. Russo (co-writer of Night Of The Living Dead) from his own novel, Midnight (1982) stars John Amplas (Martin), Melanie Verlin (Monkey Shines) and Lawrence Tierney (Reservoir Dogs). Affectionately described by DVD Talk as "a greasy, grimy, and frequently unpleasant little nugget," writer-director Russo's sordid tale of young runaways, lecherous stepfathers and inbred Satanists comes to UK DVD for the first time in the UK, completely uncut, on 29th August 2011 from Arrow Video at the RRP of £15.99.